It's officially autumn! In most of Canada, there is nip in the air and the tree leaves are starting to display their vivid colours. Thanksgiving is almost here, with many of us looking forward to sharing our holiday table, a delicious turkey with all the trimmings, and warm memories of home with family and friends. We've gathered a few gorgeous ways to decorate your home, mantle or table this Thanksgiving. These beautiful flowers and centrepieces are fresh, bursting with seasonal colours, budget-friendly, and make your holiday decorating fast and easy. Order now to avoid disappointment! These are always popular choices. 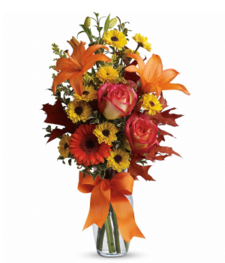 For even more options visit the Thanksgiving Collection at the Bloomex website. 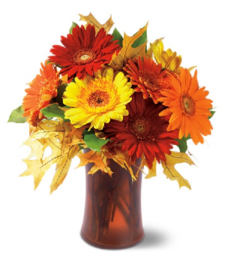 The warmth of the season radiates from this exuberant floral arrangement, featuring glorious gerberas in every color under the autumn sun. The perfect accessory for Thanksgiving. 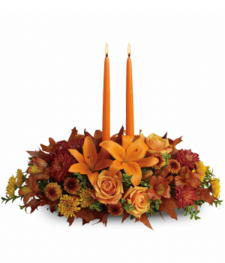 This beautiful fall arrangement makes it easy to harvest all of the happiness and warmth of the season and send it to someone special or use it to beautify your own holiday table. Here's a golden opportunity to make someone's day. Just send this delightful basket of fresh fall flowers to someone who's on your mind and you can be sure it will lift their spirits! 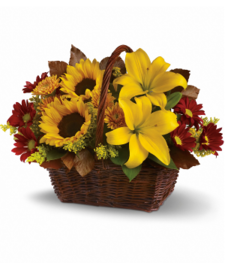 Sunny sunflowers and Asiatic lilies, deep red roses, gold and burgundy chrysanthemums, solidaster, are splendidly arranged in a wicker basket. Send it and you'll be golden, too. 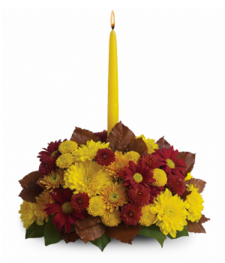 Approximately 14" W x 10" H.
This delightful centrepiece is bursting with vibrant yellows. Included in this energetic arrangement are 2 white candles, 4 large striking gerberas, 6 plump elegant roses, 6 snapdragons, 4 graceful lilies, 5 chrysanthemums complimented by fresh greens and beautiful container with special floral foam to keep flowers fresh for at least a week. 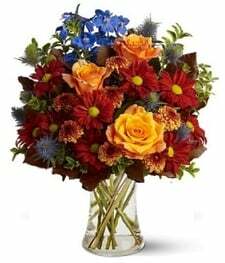 Measures approximately 16"H by 16"L.
The spirit of early pioneers comes alive in this charming bouquet of bountiful Autumn colours. The perfect accessory for your Thanksgiving celebrations. A stunning gift for this glorious season!